Engineers test the ATHLETE moon rover on one of the long dirt roads found just outside JPL. 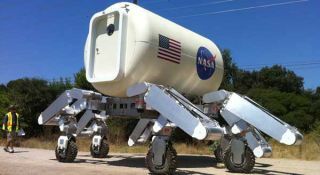 After years on the drawing board and in the lab, NASA'shuge All-Terrain, Hex-Limbed, Extra-Terrestrial Explorer (ATHLETE) rover is finallygetting a chance to stretch its six legs. ATHLETE is a half-scale working prototype of a robot underdevelopment to transport habitats and other cargo on the surfaceof the moon or Mars. The ATHLETE concept is a level cargo deck carried bysix wheels, each on the end of a configurable leg. TheJPL grounds do not include an unpaved area of sufficient size for testingsuch a large robot over a long distance. Some of the dirt roads in the ArroyoSeco, Calif. (a wash located next to JPL), are wide enough for ATHLETE, and itsclose proximity to JPL allows the robot to be secured in its hangar betweentest runs. The engineers want to testthe moon rover's ability to meet a NASA milestone of traveling at least 25miles (40 km) over 14 days under its own power. The official demonstrationis slated to begin in the Arizona high desert next month. The prototype stands approximately 15 feet (4.5 m) talland 15 ft (4.5 m) wide and weighs about 2.5 tons (about 2,300 kg). Therobot moves relatively slowly, with a top speed during traverse of approximately1.25 mph (2 km/h). This article was provided by TechNewsDaily,a sister site of SPACE.com.